Yes, Ginny is fiesty and takes no prisoners. But she does not use the Unfogiveables. And if it came down to choosing between someone I loved being hurt, or the person who was going to do the hurting ending up on the losing end, I would choose the person I loved. That's human nature. I'm one of the people who disagree. They both have red hair I guess, but Lilys' is darker, wheras Ginnys' is very bright. Apart from that they aren't likely to look any more alike then any two people with similarly colored hair. I don't think we really see enough of Lily to tell how similar their personalities are. I'm not sure. Lily is generally portrayed as being a kinder, sweeter personality (not to say she's passive, just that she's not really a fighter unless she needs to be) whereas Ginny is more feisty. Plus, as was mentioned earlier, Ginny has bright red Weasley hair where as Lily's was dark red (I hate to use this example, but I imagine her hair to be kind of like Lindsay Lohan's. I hate myself for suggesting it). "It is our choices, Harry, that show us for what we truly are, rather than our abilities." Albus Dumbledore. "We Slytherins are brave, but not stupid." - Phineas Nigellus Black. "Dreams like this must die." - RIP Andy Wood. Plus Lily has green eyes, no freckles, and is probably of average height as her height is never mentioned. Ginny has brown eyes, freckles, and is repeatedly described as short. And in personality, Lily always reminded me more of Hermione but (possibly - because we're not shown it) more of a sense of humor. Ginny is more like James in personality, IMO - the jokey, sometimes cruel, protective, fun-loving Quidditch player. JKR said it, I believe it, that settles it. Ravenclaw here but Gryffindor on Pottermore | Add me, I'm LightStar74. Yes, I definitely agree with that. I think Ginny is somewhat like James as well. I never saw too much connection between Lily and Ginny, though. They never really seemed alike to me. Marauders' girl through and through. I just don't see how Harry would make such fine and subtle distinctions, in my opinion, since he was such a young baby when his mother died. In fact, most people don't distinguish between bright red, dark red, or golden red hair. And he wouldn't recall everything about his mother's personality, imo. When people choose a mate they aren't even aware of similarities sometimes except in a very general way, and it is mostly done on a subconcious level. But I think people have a point that there are so many similarities in Lily and Ginny, and that Harry was attracted almost automatically to the Weasley family. Molly must have reminded him of his mother as well. Yes, Harry is attracted to other girls as well, who have dark hair or blonde hair, but in the end, he married someone who looks more than a little similar to his mother. Last edited by silver ink pot; March 8th, 2010 at 8:06 pm. 1. Prior to Harry rescuing Ginny from the Chamber of Secrets, how do you think Harry and Ginny viewed each other? I think that Harry viewed Ginny as Ron's little sister, and didn't think too much about her. However, I beliebe that Ginny really liked Harry. 2. What was the relationship between Harry and Ginny like between the incident in the Chamber of Secrets and the time they started dating other people during Harry's fifth year? For Harry, Ginny was just a friend. Ginny really liked Harry, and at some point Hermione gave her the advice to start seeing other people and to be herself. I think that their friendship grew over those years. 3. Starting in Harry's fifth year, Harry and Ginny start dating other people. Do you think they helped their own relationship form by dating other people? Did they both harbor feelings towards each other during this time? Definately! I think that its great to date other people, because it makes one realize how much they love the person that they're with. It can streghten the relationship. In Ginny's case, I think she harboured feelings, didn't she say something like "I never really gave up on you" to Harry at Dumbledore's funeral? As for Harry, I think he realized how much he loved her over the years. 4. How did their relationship evolve from the time they started dating each other in Harry's sixth year until the end of the Battle of Hogwarts? They really, really liked each other. I think that absence made their hearts grow fonder. There was Harry's birthday gift from Ginny, and Harry staring at Ginny's dot on the map for hours. They probably thought about each other all of the time. 5. What qualities do Harry and Ginny have that brought them together? How does their relationship work? Definately understanding--Ginny understands completely when Harry breaks up with her at Dumbledore's funeral. Most girls, including myself, wouldn't have reacted in the same way. They both have bravery and courage, this is demonstrated countless times throughout the series, and of course they are Gryffindors. Both of them have a great sense of humor and are very loyal--they would do anything for their friends. And of course, they both have the ability to love. 6. We see in the epilogue that Harry and Ginny have married and have three children. 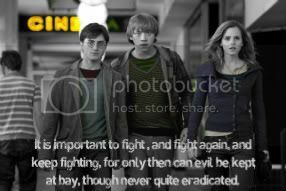 How do you think their relationship evolved between the Battle of Hogwarts and the epilogue? I think that they fell deeper and deeper in love. Although it would have been hard at first, with Harry out catching the remaining Death Eaters. And Harry probably went to all of Ginny's quidditch games. At some point, they got married. I don't think that they would have had a big, flashy wedding because they are both very humble characters. 7. What kind of parents do you think Harry and Ginny would be? Patient, kind, caring, understanding, all around wonderful. They had a good example to follow (Molly and Arthur), and Harry would want to be like the parents he always wished that he had. There would always be a lot of laughs. I believe that they would be fabulous parents. Harry wouldn't compare Ginny to his mother at all because he hardly remembers his mother so that entire line of reasoning is a unfounded and not backed up by canon at all. In canon, he compares Ginny to other Weasleys because he is more familiar with them and their behavior than he is his mom's. In fact, most people don't distinguish between bright red, dark red, or golden red hair. Who are most people? There's a huge difference between bright red hair and auburn just like there is between light brown hair and brown-black. And a pretty obvious one too. And it's one that most people can tell. To use Rose and Scorpius in my sig picture as an example - no one would describe that Rose as having bright red or orangey-red hair just like no one would describe that Scorpius as having sandy blond or dark blond hair. It's obvious she has dark red hair or auburn hair and that he has platinum or white-blond hair. who looks more than a little similar to his mother. No, she really doesn't unless you think people with vaguely similar hair colors all look the same. Zacharias Smith doesn't look like Draco Malfoy and neither of them look like Ernie Macmillian even though they are all male with blond hair. Pansy Parkinson doesn't look like the Patil twins. Harry didn't look like Tom Riddle. Snape didn't look like Sirius Black. They are the same gender, have the same hair color, but don't look similar at all the same way Angelina Jolie doesn't look like Salma Hayek. And Harry likes red-headed people - Weasleys, Dumbledore - because JKR does. And JKR likes them, at least in part, because gingers are often maligned in the UK. Last edited by birdi86; March 8th, 2010 at 6:49 pm. That's all well and and good, but the Harry doesn't marry Ginny because she is maligned in the UK. He marries her (possibly) because she looks like his mother. Ron also marries someone who is constantly compared to his mother, so I think the canon is consistant in that regard. Are any of those descriptions in the books except for Lily's "dark red" hair? We are talking about Harry here, who is one of the most unobservant characters in all of literature until the final book, in my opinion. I also wrote in my last post that Harry's choice of wife is probably subconscious, and not conscious. He isn't comparing Ginny to Lily's picture or anything, but he remembers her from his babyhood. I don't think there was anyrthing in the text to conclude Harry married Ginny because she looks similar to his mother. Harry pretty much grew up with the Weasley from the start of his Howarts years. We see him hang around to Ginny more starting in Book 5, and they're both in Quidditch. So there are other factors shown in the story and text than as to how and why Harry and Ginny grew closer that has nothing to do with hair color. Ginny is described as having bright red hair (if I'm not mistaken) in COS. And there is a huge difference between dark red hair and bright red hair (from those that I've seen at least). Even if Harry is an unobservant person, this still doesn't prove that Harry's attraction to Ginny has some unconscious relation to his mother. The Weasley's could have had black or brown hair, and the plot and character relations would still remain the same. I went in reading Deathly Hallows fearing the final end of Harry Potter, and came out an insane Sev/Lily Shipper. I don't understand it either. Last edited by RavenStar83; March 8th, 2010 at 9:11 pm. Are any of those descriptions in the books except for Lily's "dark red" hair? Lily is described as having dark red hair in PS/SS, the Mirror of Erised and as for Ginny, the entire Weasley family is described as having "vividly" red hair and her hair is described as flaming and fiery, for example in CoS: "She nodded, blushing to the roots of her flaming hair, and put her elbow in the butter dish. Fortunately no one saw this except Harry... "
And fire and flames tend to be on the "bright red" end of the spectrum. Harry is our point-of-view character. If we doubt everything he says - even when we're given no reason to - it really throws the entire series off. Harry changes his mind about many things by the end of the series. But oh well. I'm not really sure why the idea that Ginny reminded Harry of Lily bothers so many people, but I'm done with it. I am really puzzled by this and I know you said you were done with it, but please, where is Hermione compared with Molly and how does it justify comparing Lily with Ginny? Several times in OotP, Hermione is compared to Molly by both Sirius and her future husband Ron. Hermione bit her lip and did not answer. How is it justified, you ask? It's canon that fits my own personal opinion, of course. I think the characters married people who reminded them of their mothers. We can quibble about hair color, but the main thing is that Lily and Ginny both have red hair and a cheeky sense of humor. I don't expect anyone to agree with me, although someone did earlier which is why I posted here in the first place. Hermione is compared to Molly briefly in OOTP (they both react similarly when Harry comes to Grimmauld Place, IIRC) and are both mothering and bossy. That's about it when it comes to their similarities. JKR once said Lily and Ginny were both popular, which tends to get blown out of proportion. (Many of the characters we see - Harry, the Trio, the Weasleys, Draco, Ginny, Cho - could be described as popular depending on how and when you chose to define them as such. Hogwarts is a very small school. Harry only has about 30 people in his entire year. It's more noticeable and rare when someone is unpopular - like Luna or Snape.) But that's about it for Ginny and Lily comparisons in canon or elsewhere. JKR has also compared herself to both Lily and Ginny, since she said that she felt like Harry's mother, but also felt like she and her husband were similar to Ginny and Harry. That's a big comparison if you put alot of stock in what JKR says. (JKR also had red hair at the beginning of her writing career, for whatever that is worth). ETA: I'm not sure how many comparisons would be necessary to prove a parallel between these characters to everyone's satisfaction, so . . . good-bye for real this time. For me, Ginny was always like a present-tense Lily. I guess (though I'm admitting it grudgingly) that the length and colour and texture of the hair did have a little to do with it.... but that's just on the outside, people. I think it goes much deeper that that - both of them are extremely kind and loving. I agree Ginny is more - fiesty, a bit malicious - but that could have been because she's grown up with six brothers, Harry says so himself, whereas Lily grew up with one fussy sister - and that's on the outside too... at least for me. What really seems to me to be the connection between Lily and Ginny is their love for Harry. Dont you think, if Lily had been alive, she'd have gotten extremely close to Ginny as a daughter-in-law? Further, Lily and Ginny are both very brave, and do not like people who try to show off - James (when he was still a show-off) and Fleur. I really think Harry would relate Ginny to Lily. He might even relate Lily to me.... .... except that my hair is black. Harry's sudden interest in Ginny? In the first 5 books, Harry shows no attraction to Ginny. Yet, suddenly, he starts to like her in the 6th book. Why? I know she starts acting more like herself, but I've never read anywhere in the book where it states why he starts to have in interest in her. I don't know; I'm probably over-thinking this. I'm sure there are reason's stated somewhere in the books, but I've always been curious about it. Sorry if this is a stupid question, I'm just curious as to what your thoughts are on the matter. Ginny had a crush on Harry and felt shy around him. I think Harry just thought of her as Ron's little sister and didn't have much of an opinion about her. I don't think much changed until the fifth or sixth book. They became closer as friends, but she still had a crush on him (and acted a bit shy), and he still thought of her as Ron's sister. When Hermione gave her that piece of advice, she started acting like herself around him and he obviously liked her for who she was. I think it helped them be more themselves around each other, as they both had their own thing going on, and took away some of the awkwardness (on Ginny's end). I think amidst all the danger, the "camping trip excursion" and all the worrying about each other's survival showed them just how much they cared about each other. I think the distance only strengthened their feelings. They both have immense loyalty and courage. Another thing they share is the "Voldemort experience". They've both experienced quite a bit of popularity. They also balance each other out in terms of the fact that Ginny's a little fireball and Harry is more drawn back. Their feelings became deeper and more mature, as usually happens over time. Like all couples, they've probably had their rough patches, but they learned how to get over them and worked out a healthy marriage. They'd probably both be "cool" parents, with Ginny being a famous Quidditch player and Harry being the one who survived the Killing Curse twice and defeated the most powerful dark wizard of all time. They were probably pretty close with the kids, as Albus confides in Harry about his worries before boarding the Hogwarts Express. I think they were "cool" parents, but also had a lot of influence over the kids. In the epilogue, there's a part where James is teasing Albus, but he's silenced with a look from Ginny. Their daring, nerve, and chivalry set Gryffindors apart. "I solemnly swear that I'm up to no good." Proud supporter of: HWRKDJCKQ. I have yet to figure out what that means. Re: Harry's sudden interest in Ginny? Well, I don't see things the same way. But it's been so much discussion on this that I'll give you some essays to read. And I don't think it's a stupid question. It happens all the time. By the way, anyone knows what happenned to the essays on Ron/Hermione in the Sugar Quill? JKR has also compared herself to both Lily and Ginny, since she said that she felt like Harry's mother, but also felt like she and her husband were similar to Ginny and Harry. I don't recall either of those comparisons but if so, she's also said Hermione is a lot like her at that age. I wouldn't be surprised if many of the characters share some similarity to JKR in one way or another. All times are GMT +1. The time now is 6:21 am.